Wood holds unique and timely lessons for urbanization, yet it remains inadequately characterized in architecture, landscape architecture, and urbanism. From under-considered thermal properties to emerging manufacturing possibilities, from changing forestry regimes to larger carbon cycle dynamics, Wood Urbanism explores the unique material and scalar properties of wood, presenting it as a critical material for design today. Daniel Ibañez is a practicing Spanish architect and urbanist based in Cambridge, Massachusetts. Dani is the co-director of the Master in Advanced Ecological Buildings at IAAC and the co-founder and director of the design firm Margen-Lab. At Harvard University, Ibañez is instructor and Doctor of Design candidate, editor of the New Geographies Journal and researcher at the Urban Theory Lab and the Office for Urbanization. 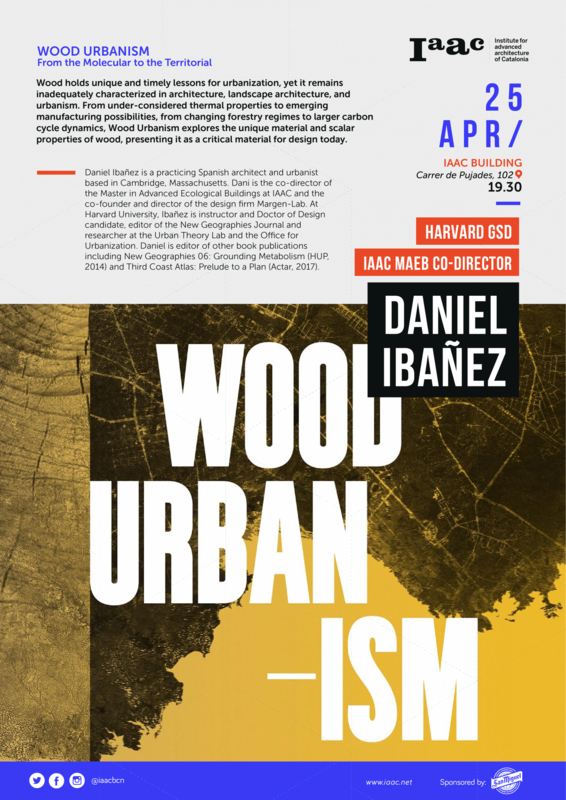 Daniel is editor of other book publications including Wood Urbanism: From the Molecular to the Territorial (Actar, 2018), New Geographies 06: Grounding Metabolism (HUP, 2014) and Third Coast Atlas: Prelude to a Plan (Actar, 2017).